Committed to providing the highest level of customer satisfaction, we are engaged as steam solenoid valve supplier, manufacturer, and exporter in India. We are manufacturing these quality valves to suit different industrial applications. They are also suitable for any types of coffee vending machines, steam generators, and applications of low temperatures. These are the type of electromagnetic valve, which is used to control air, water, and steam and gas flow. For moving the piston in the valve, electrical power is supplied in the bobbins. Piston energizes and becomes electromagnet when the electrical current passes through the coil and start moving as per the stage of the coil. Then inlet channel start pushing the fluid in the output direction. A two way solenoid valve is a type of solenoid valve, which has two ports, one is for inlet and other is outlet port. The two-way solenoid valve is a popular range of solenoid valve across the wide variety of valves from the basic on-off valve to valves with variable flow control application. Especially for variable frequency drives and pumps. Selection of right valve mainly depends on the amount of the flow, pressure drop, degree control and shut off. Our special type of two way solenoid valve requires a minimum pressure difference for proper functioning. 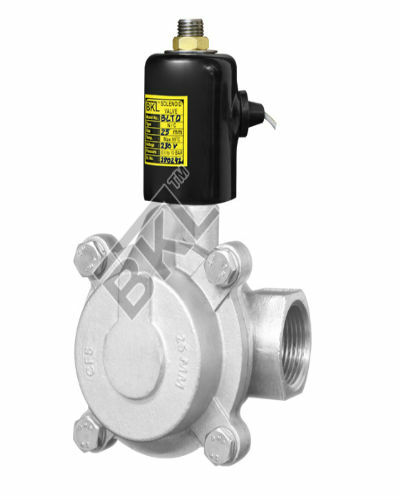 Our steam solenoid valve is available for different water application and combination with various diaphragm materials. Our offered steam solenoid valves are chemical resistant and supplied with reduction of electronic power for the requirement of less energy. It is also equipped with manual functions for swift and easy maintenance. As a leading steam solenoid valve supplier in India, we are able to supply solenoid valve as per customer requirement and specification at market leading prices. Our supplier solenoid valves have a long life, anti-corrosive feature, use less power and require minimum maintenance.